Another book was added to the Territory’s literary collection, when Dr. LuVerne Baptiste launched her first book “Out From Under My Rock”. Mrs. Lettsome-Tye noted that the book takes an honest, harsh look at our practices and beliefs and the journey of finding out who we really are when the dust has settled and the fog has cleared. She commended Dr. Baptiste for putting the process in writing, which gives everyone somewhere to look when walking a similar road, and which provides encouragement for all of us to come from under the rock and take life on. “I would like to encourage other writers to follow in the footsteps of Dr. Baptiste and others who have launched books this year. Continue to document the rich texture of our customs and practices and continue to tell the story of our fore fathers and times past so that our great grandchildren have a plethora of material from which to learn their history and culture,” she urged. Meanwhile, Author Dr. LuVerne Baptiste said that the text will give readers a deeper appreciation of the value of life and it will help them to discover themselves. Dr. Baptiste shared that the inspiration for the book came as she was at the funeral of a prominent business woman and sister. “There were so many good things being said about that individual; which raised the question, what will be said about me when I die? At that very moment I started to write a chronology of my thoughts,” She recalled. Other speakers at the book launch were Pastor Keith Grant, President of the H. Lavity Stoutt Community College Dr. Karl Dawson and Mrs. Lashan Rabsatt Audian who read an excerpt from the newly launched book. 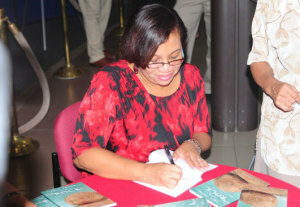 Out From Under my rock is the sixth book launched by the Department of Culture in their efforts to promote the literally works of local authors as a means to transmit the Virgin Islands Culture to present and future generations.